As our readers respond to the UK's decision in June 2016 to leave the EU, Chemical Watch will track the actions and opinions of all stakeholders in the chemicals risk management and regulation field. We will report on the actions of the UK government and stakeholders including British businesses. We are in close touch with EU regulators, businesses and NGOs and will bring you their latest thinking and actions. We will also use our strong contacts to canvass views and monitor responses globally to help all our readers understand what, if anything, changes for their way of doing business. Guest Column: Will Brexit return control to the UK chemical sector? Will Brexit return control to the UK chemical sector? The future of chemicals policy - what can we learn from the past? Brexit: is a UK-REACH Regulation on its way? Will Brexit mean avoiding the burden of REACH? May 2016 - Cleaner water and air, better managed waste, protected habitats, safer beaches – these are some of the benefits that citizens in EU countries have enjoyed over the last forty years. These could not have been achieved as effectively without the combined political and scientific might, and skilled transboundary and cross-cultural negotiations, that are at the heart of the EU policy-making machine. 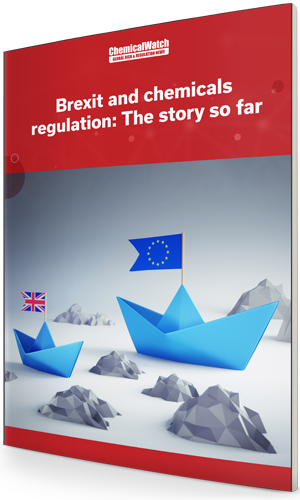 Download this free report to find out how the story has evolved and shaped the current situation as we countdown to the UK’s departure from the EU.